The two main political camps are fighting for power in two distinct conflicts, one centred on Tripoli, the other on Benghazi. General Khalifa Haftar's 'Operation Dignity' troops are at war with Islamist groups for the control of Cyrenaica in the east. Haftar's forces have the upper hand so far. They are loyal to a government in Tobruk under its Prime Minister, Abdullah al Thinni. The other conflict pits militias from the mountain town of Zintan and their allies from the Fezzan against the Islamist Fajr Libya (Libya Dawn) alliance, which is supported by backers in the wealthy coastal town of Misurata and in the capital, Tripoli, itself. The Fajr Libya forces control Tripoli, supporting a government under Prime Minister Omer el Hassi, and have the upper hand in that theatre of war. Meanwhile, a perilous contest for control of the nation's oil and money is under way and it is this, rather than the fighting, which could split Libya in two. And the fighting is spreading to towns in the south, near the El Sharara oilfield, and drawing in rival ethnic groups in the area such as the Tebu (backing Al Thinni) and the Tuareg (backing El Hassi). In the last six weeks, the fighting has claimed some 400 lives as Haftar's forces hem jihadist groups, such as Ansar el Sharia, into a last redoubt in the port area of Benghazi (AC Vol 55 No 21, Comrades in arms deals). Haftar, a retired general who took part in Colonel Moammar el Gadaffi's coup in 1969, was captured by Chadian forces in 1987 and then spent two decades in the United States. He launched his offensive against Islamist terrorism in May (AC Vol 55 No 11, Enter the General). It was a response to the Islamists' ruthless campaign of violence in which scores of senior military officers and US Ambassador John Christopher Stevens and three colleagues were murdered (AC Vol 53 No 25, Unity under strain). In Tobruk in late August, Prime Minister Abdullah al Thinni appointed Haftar's deputy, Abdel Razek el Nazuri, as his Chief of General Staff, incorporating Operation Dignity's much needed capabilities into the feeble national army. By late September, the Operation had been transformed into an Egyptian-backed campaign against Islamism in general (AC Vol 55 Nos 12, Cairo leans on Khartoum, and 23, Security leaks and party splits). The conflict in the west is now being won by those on the other side of the ideological divide. Fajr Libya succeeded in August in expelling the Zintani militias from Tripoli International Airport, which was destroyed in the fighting. The Zintani fighters retreated to the mountains south of Tripoli and the conflict shifted to some of the coastal towns and into the desert. An intermittent battle has raged between the rival areas of Zawiya and the Tripoli suburb of Warshefana. Tripoli itself has been relatively calm although one observer described it as a 'city under occupation'. Fajr Libya's airport victory has allowed it to make important gains because it physically controls ministries and other institutions in the capital. The Tripoli government is headed by Prime Minister Omer el Hassi, who was appointed by the former General National Congress, the parliamentary body that was replaced in June's elections by the House of Representatives (HoR). The HoR, based in Tobruk, appointed Prime Minister Al Thinni to lead it. While Al Thinni has been internationally recognised, El Hassi has not. On 6 November, the balance swung back towards the GNC when the Supreme Court controversially ruled that the HoR's election was unconstitutional and therefore invalid. While there are good reasons to doubt the impartiality of the Tripoli-based judges who took this decision, the United Nations, European Union and USA have held back from expressing definitive opinions on its validity. This is because the favoured international solution is still a 'grand bargain' under which both sides are forced to compromise over national unity. The UN Support Mission in Libya has announced it will host a new round of 'national dialogue' on 9 December in another effort to bridge the gap between the two sides. While the HoR clearly has the democratic right to rule, having been elected in a nationwide poll that was judged to be free and fair, it has lost much of its de facto authority since the election (AC Vol 55 No 17, Parliaments at sea). This is partly because most of the Libya is out of its control. However, this is also because, strongly influenced by its foreign backers, Egypt and United Arab Emirates, the HoR has adopted highly partisan positions. 'It is too late for that side to become an inclusive body', said a European diplomat. The main reason why wages and subsidies are still being paid nationally, and some oil production and exports have also continued, is that some core Tripoli-based institutions, such as the Central Bank of Libya, Libyan Investment Authority and National Oil Corporation (NOC), have established a shaky autonomy from both sides. This precarious balancing act may soon be upset, if some members of the HoR have their way. The first suggestion that the Al Thinni government was considering an attempt to establish unquestioned control over the NOC emerged in mid-November, via international oil market rumours that a new Chairman had been appointed, with plans to establish a new headquarters in the coastal oil town of Ras Lanuf. Yet it was not until the Organisation of Petroleum Exporting Countries (OPEC) meeting in Vienna on 27 November that Deputy Prime Minister Abdel Rahman el Taher introduced El Mabrouk Bou Seif to journalists as the replacement for the Tripoli-based NOC Chairman, Mustafa Sanalla. 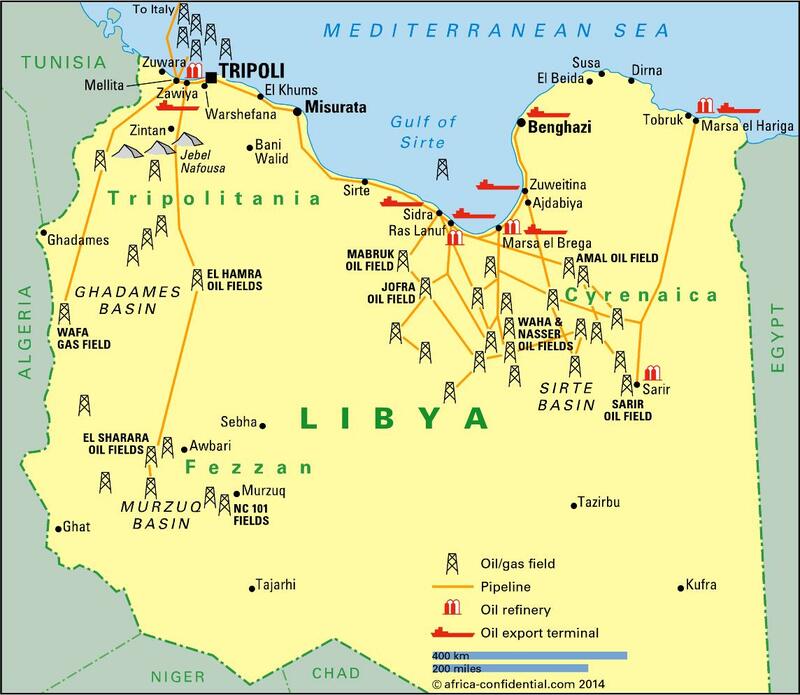 Should Tobruk re-establish the oil payment system beyond the reach of the Tripoli institutions, it would immediately control most of the resources in the east. El Hassi's government might, however, have a grip on some oil infrastructure west of the capital, including some offshore oil and gas production and export facilities, as well as the main gas pipeline to Italy. The key part of the western infrastructure not in its hands at present is the oil pipeline from the south-west to the Zawiya terminal and refinery. This is blocked by Zintan militias. Western governments regard unilateral moves by either side to control these economic resources as a 'red line', AC understands. A source involved in diplomatic discussions on these matters recently noted that 'if they try to get hold of the resources or money, then we will have a very big problem in Libya'. Rather than allowing the de facto division of the country with rival governments selling oil and accepting payments independently, international bodies are more likely to impose sanctions on all exports. Hitherto, UN and EU diplomacy has focused on establishing a dialogue between the rival governments or at a minimum, to maintain the status quo until the publication of a draft constitution by the Beida-based Constitution Drafting Assembly provides an alternative route out of the morass. Yet while Western governments and the UN oppose attempts by either warring party to control the main institutions, other international players are pushing strongly in the other direction. In particular, Egypt and Abu Dhabi in the UAE, have emerged as strong supporters of the Al Thinni government. In an interview with Italy's Corriere della Sera newspaper on 28 November, Haftar said that Algeria, Egypt, Saudi Arabia and the UAE had supplied ammunition and arms 'but only their older technology'. Egypt is also said to be giving other undeclared military help to Haftar's campaign; recent air strikes on Islamist positions are understood to have been carried out by Egyptian and Emirati jets, without any consultation with the US or other Western governments. Sources familiar with diplomatic negotiations over Libya say Western countries and the UN worry that Egypt and the UAE's help is encouraging the Al Thinni government's reluctance to negotiate. They said that the West so badly needs Egyptian and UAE co-operation over the Islamic State in Iraq and Shams/Levant (ISIS/ISIL, also known as Da'ish or IS) that they believe they cannot realistically exert any pressure on them over Libya. Such dynamics show the extremely limited role that Western powers are willing to play in tackling one of Africa's worst civil wars, whose destabilising effects could spread across the Sahel. * Leader: Prime Minister Omer el Hassi. * Claims legitimacy from the rump General National Council, elected in August 2012 and officially dissolved in August 2014. * Domestic support: Fajr Libya (Libya Dawn): Misurata militias, Islamist groups, Tuareg groups. * International support: Qatar, Turkey and Sudan. * Opponents: Zintan militias, Operation Dignity. * Leader: Prime Minister Abdullah al Thinni. * Claims legitimacy from: House of Representatives, elected June 2014. * Domestic support: Operation Dignity, led by General Khalifa Haftar, Libyan air force, special forces and other army units; Cyrenaican federalist groups, including Ibrahim el Jathran’s Cyrenaica Political Bureau; some Tebu (Toubou) militia. * Opponents: Benghazi-based Islamist militias, including the 17 February Martyrs and Rafallah el Sahati brigades; Benghazi- and Dirna-based Islamists, including Ansar el Sharia. Prepared for Free Article on 24/04/2019 at 11:21. Authorized users may download, save, and print articles for their own use, but may not further disseminate these articles in their electronic form without express written permission from Africa Confidential / Asempa Limited. Contact subscriptions@africa-confidential.com.